When Things Happen for a Reason by Nancy Weshkoff | Moonflower Yoga Inc.
Life is often like a roller coaster. You encounter some curves and dips that you were not expecting. And when that happens, I always think that what has occurred has taken place for a reason, even if that reason is not immediately apparent. I had one of those drastic roller coaster curves 3 years ago this week. Some of you may know that my past experience before Moonflower Yoga was in the corporate world, specifically I was in the music industry on the business side. It was very interesting, and I met some amazing people, but it also had its stressful times. I had been in the music business more than 30 years. Three years ago this week I received the news that I was being laid off from my current position. It was a shock that I was not expecting. What made it much worse was that my husband had lost his job of 30 years just 3 months earlier when his employer went bankrupt. Now we were both unemployed, just as the recession was hitting its peak and companies were not hiring and making their own cutbacks. Things looked very bleak. Yet, through it all, I kept a positive spirit that things happen for a reason. My yoga practice had always been my savior, and I found that yoga and meditation helped me with this drastic life change. When my yoga teacher announced the start of a teacher training program, I enrolled – still not sure where this was going to take me. When I completed the training and graduated, I knew that my life was meant to go in a different direction. The corporate world was no longer my path. I also knew that I wanted to be in charge of my own destiny and start my own yoga business, bumpy as that was going to be. And so Moonflower Yoga was born! I took a giant leap of faith and signed a lease to rent space for my new venture. Those first few weeks of having the doors open were challenging as I worked hard to build the business. Each month things improved and more and more people walked in the doors to try a yoga class. Now Moonflower Yoga has been open for more than 2 years, and yoga classes are selling out with waiting lists. What has also happened is that I have met so many amazing – and inspirational – people that I would not have met if I had stayed in the music industry. There are a wonderful group of students who I am blessed to have walk through the doors of Moonflower Yoga to try a yoga class or workshop. Many never tried yoga before, and they have fallen in love with yoga as I did. Yoga has helped them cope with their own difficult life challenges in a positive way. At the same time, I have learned things from these amazing students and getting to know them has helped me grow as well. I am also blessed to have a very dedicated group of teachers at Moonflower Yoga who also love teaching and helping people. And so I go back to the start of this blog…. Things happen for a reason. Although I did not know it 3 years ago, being laid off from the corporate world enabled me to have this incredible new chapter in my life. My husband, who had lost his job 3 years ago, found a new position at a great company that is closer to home. 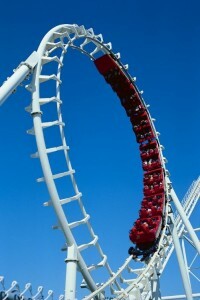 If you are feeling as if life has thrown you into a dip on the roller coaster, think positive! And if you would like to experience an amazing yoga class or workshop to help you feel better, come join us at Moonflower Yoga in Bellmore, in Long Island’s Nassau County (New York). And always remember that things do happen for a reason.